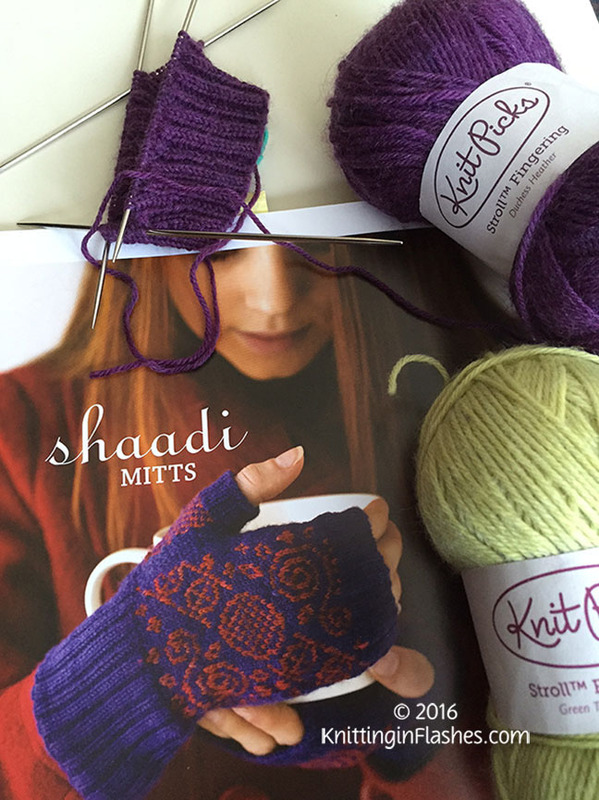 The Shaadi Mitts I began last January then restarted them because they were too large (even with the right gauge) are no more. 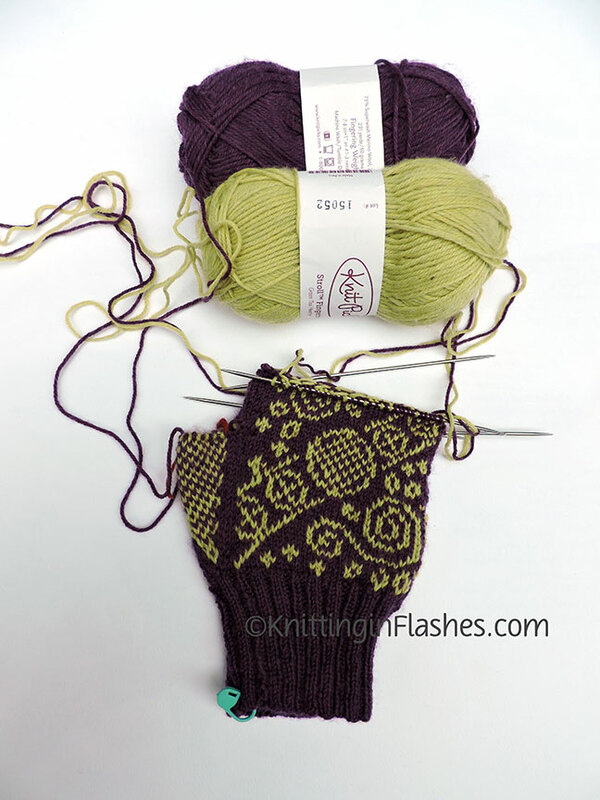 The pattern notes indicated that these mitts are challenging and I thought I was up to the task. 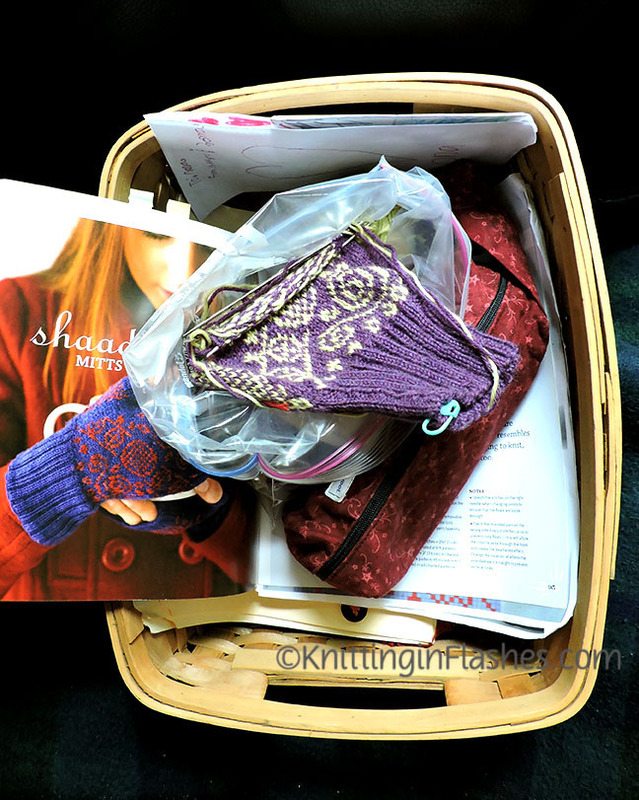 Well, sometime last spring I lost my knitting mojo and allowed them to languish in my knitting basket for months and months. 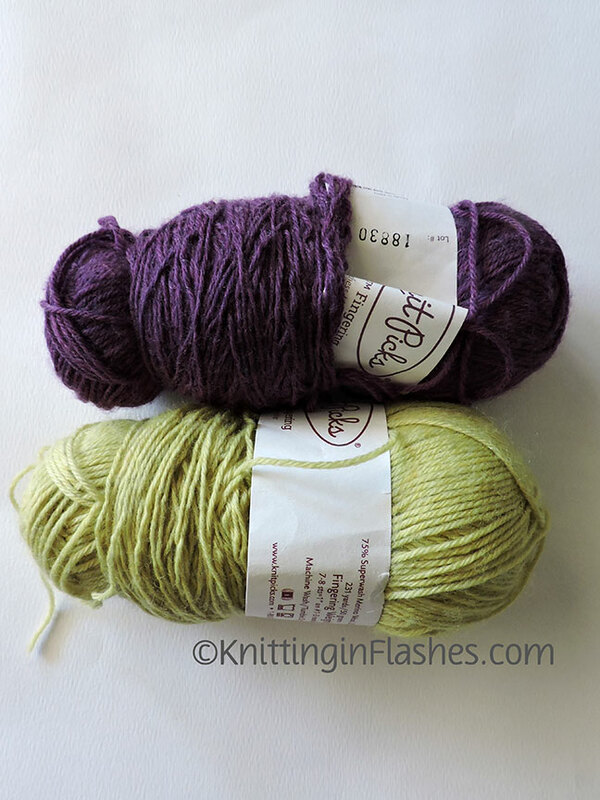 And when I picked them up again, I forgot about how to hold the dominant yarn vs background yarn. The dominant yarn color goes under the background yarn color where as the receding (background) yarn color goes over. It doesn’t seem like it would be that important but it is. Very. 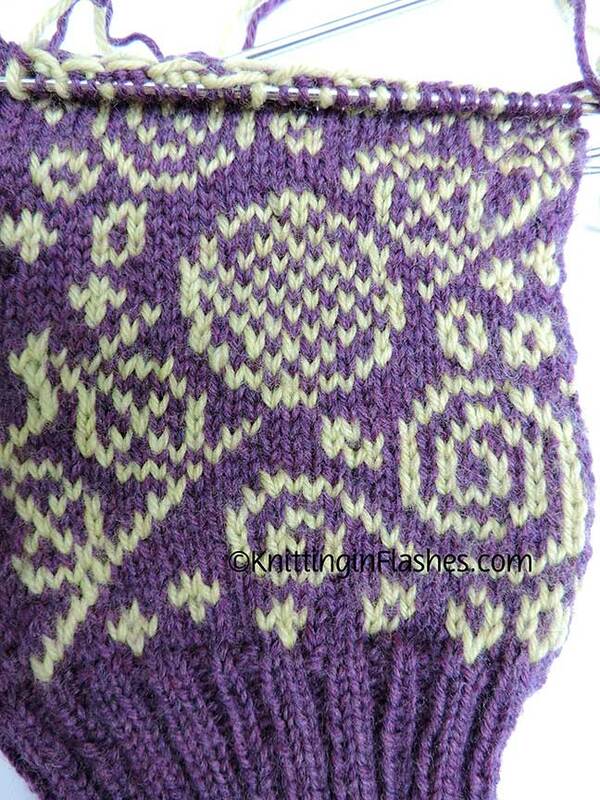 The longer strand of yarn is the one under the shorter upper yarn which makes the longer yarn stand out more. 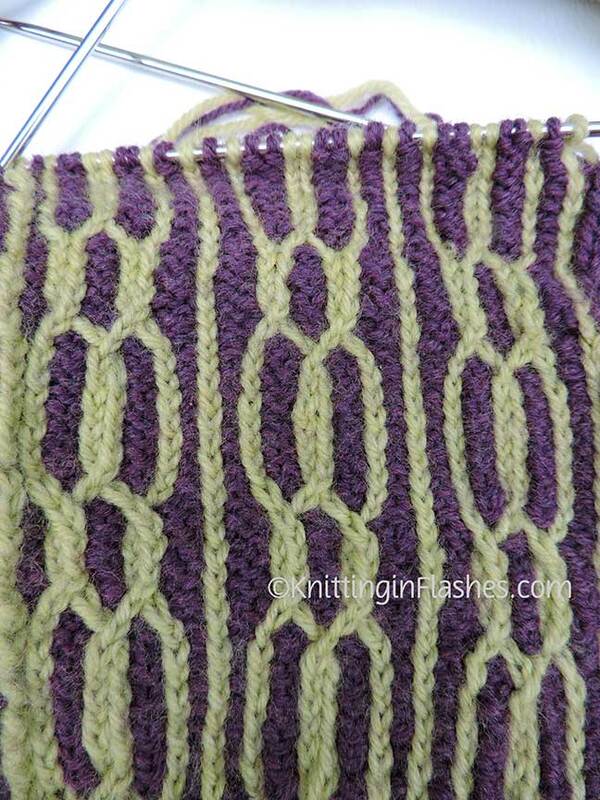 The shorter upper yarn pushes the longer strand out. You can see here that the purl stitches recede in the lower section but are more prominent in the upper section where I reversed the dominant and receding yarns. 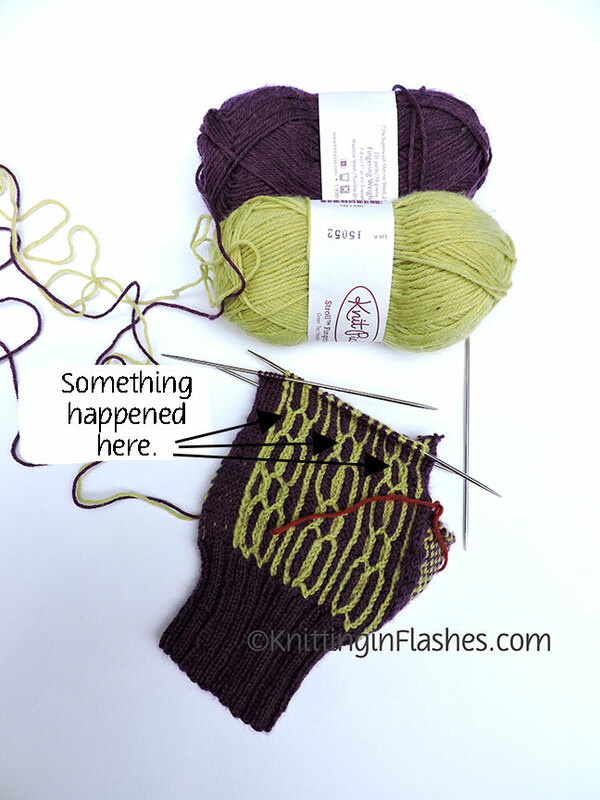 For a better explanation visit these sites: Knitting Daily, Paper Tiger, and Ysolda Teague. On the front side the circles and spirals appeared smaller in the last sections. This was all due to yarn dominance. Then I screwed up the Bavarian twisted stitch. The mitts were still huge and I just wasn’t having any fun knitting them anymore. What do you do about a unfun project? Let it hibernate, rip it out, continue with the drudgery or throw it away? Good-bye Shaadi Mitts. Maybe another time. This entry was posted in gauge, knit, knitting, knitting pattern, mittens, mitts and tagged fingerless mitts, knit, knitting, mittens, mitts, yarn by Patti_is_knittinginflashes. Bookmark the permalink. That design and those colors would make a snazzy hat. Last year, I bought a project, complete with yarn. It still sits, untouched. I still love the color of the yarn, but not necessarily the jacket/sweater. Sigh. Decisions, decisions! The colors will be used for something else. I’ve not bought a kit but the yarn to make a project. The longer it sits, the less I love the original project. When you stop being happy with the project. Stop. Move on! Be happy! Life is too short to waste on unhappiness. I would do the same. Too bad, because the colors you chose really worked well together. Another time, maybe…. Reserving those colors for another project. I might go back to those mitts but the frustration is too close for now. I hear you! Save them, and the right project will come along. I usually end up ripping, but only after much dithering. I was dithering about this for some time. Perhaps my ripping frenzy made decision easier. They were for my daughter so now I have to come up with something just as fantastic.